God never gave any command to Adam, Noah, Abraham, Moses, David, Solomon, John the Baptist or any of the prophets to PRAY 5 TIMES A DAY. God never gave any command to Adam, Noah, Abraham, Moses, David, Solomon, John the Baptist or any of the prophets to PEFORM WUDHU. God never gave any command to Adam, Noah, Abraham, Moses, David, Solomon, John the Baptist or any of the prophets to RECITE SHAADAH. God never gave any command to Adam, Noah, Abraham, Moses, David, Solomon, John the Baptist or any of the prophets to FAST FOR 30 DAYS FROM SUNRISE TO SUNSET. God never gave any command to Adam, Noah, Abraham, Moses, David, Solomon, John the Baptist or any of the prophets to WEAR A WHITE CLOTH AND CIRCUMAMBULATE A BLACK STONE. I could go on and on but it is obvious that Jesus, whom muslims say is one of the greatest prophet and whom they claim to love and obey, never said to do any of these things either. The question is where did these Islamic rituals originate from and when did it come into Islam? The answer: from the Sabians. According to Dr Rafat Amari, in “Occultism in the Family of Muhammad”, Waraqa was an important leader for the Sabians. Yes, THAT Waraqa! Khatijah’s cousin, who convinced Muhammad that he was a prophet! Now we understand how Muhammad was influenced in the early days! Ibn al-Nadim wrote in his book, “al-Fahrisit”, about various religious sects in the Middle East. He says in the month in which the [Sabians] fasted for thirty days, they honored the god Sin, which is the moon. They observed the festivals of Fitr (breaking the fast at the end of the month) and Hilal (new moon), in such a way that the festival of Fitr occurred when the sun entered Aries. And they used to honour the House of Mecca (Kaabah). 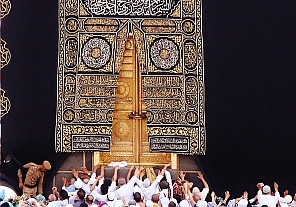 According to Dr Rafat Amari, the Sabians look toward Yemen and pray 5 times a day. Muhammad simply picked up these pagan rituals and adapted them to his new religion while claiming they were instructions from Allah. Even the shaadah was plagiarized from the Sabians. The wudu, miswak and ghusl ritual cleansing were copied from Zoroastrianism. Did Jesus Come For The Gentiles? sabaean are mystery most believe them they are yemenis who rule by queen saba wife of prophet solomon alaihisalam.we found Yemen was converted to Judaism and also Christianised by king negus of Ethiopia.because they have historically monotheistic.what do you call middle Eastern Muslim scholar said is not approved by secular historian.history record of mandean who advant of Islam name themselves as sabaean to be safe.there another sabaean believed to worship star but Arab didn’t find them in Mecca Medina they were complete unknown to Muslim Jew Christian at that period.we Muslim fast one day first it was the 1st Muharram after that we are ordered to fast one month like jesus fast 40days.jew also fast following moon calendar.eid up fitr is for celebrate the day of complete fast because Arab muslim have no festival celebration they celebrate nauroj why was forbidden for pagan origin. you selectively quote some anti Islamic source to wreak Islamic faith.in Mecca there no sabaean or Jew and in Medina there Jew but no Christian or sabaean.we believe books of two hadith book sahi Muslim sahi Bukhara .